keep an eye on everything you prize. A wireless security camera that’s as smart as it looks. 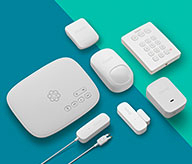 We’re proud to introduce the latest addition to the Ooma Smart Security family. Designed to protect your home both indoors and out, Ooma Smart Cam packs the latest in smart security technology in its small, elegant design. Reduce false alarms with facial recognition. No one likes getting overloaded with security notifications, especially false alarms. Our state-of-the-art facial recognition means you can customize settings for family, friends, or even pets. Get the updates you need when you need them – it’s that simple. Ooma Smart Cam is 100% wireless and weatherproof, meaning you can place and mount it anywhere indoors or outdoor in your home. Every Ooma Smart Cam comes with six months of rechargeable battery life, meaning your security will continue to work during internet and power outages. During emergencies, every second matters. When home security events are detected through noise or motion, Ooma Smart Cam uses motion detection to begin recording instantly and automatically. Details are important, which is why every Ooma Smart Cam also comes with full 1080 HD video. Ooma Smart Cam is coming soon! Join the pre-order list. We will inform you when it is available. 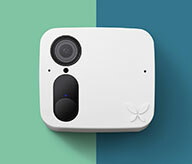 Ooma Smart Cam is part of the complete Ooma Smart Security system. Choose from a range of cameras and sensors, all designed to keep you aware of important things happening at home.